How to Fix a Drafty Window | Oh Sarah O ! It is my first winter in my apartment and the temperatures outside are in the single digits and the predictions for the rest of the week are just as bad (the current temperature is 8 degrees Fahrenheit). As the temperatures began to drop, I discovered that the back bedroom window on the north side is terribly drafty. However, I didn't want to spend money to fix it. So what is a recent master's graduate to do? I only had a 2 pack of medium hooks, so I placed them I either side of the window. Since my apartment isn't picky about holes, I hung a nail in the center. Being a recent graduate, I have a lot of left over binder clips left over from school, and I hung a binder clip on each of my hooks and nail. 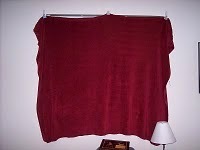 Then I took this fleece throw from the couch and clipped it over my window using the binder clips. TA DA! It's not the most elegant or permanent solution, but it will last until the weather heats up. When it does, I can simply remove my hooks, unclasp the blanket and place it back on the couch. Do you have a solution for drafty windows or have you tried tutorial? Let me know by leaving a comment below.